Material:92% Polyamide / nylon + 8% spandex. Free Size in this product fits Bust:- 76 cm - 86 cm / 32-36 inch. Length:- 30 cm / 11.8 inch.Highly elastic and flexible fabric gives good shaping. Removable pads-The inside of the cup has a small opening that contains a removable pad. Removable pads are easy to put in & take out. Qick-dry fabric technology wicks sweat, and keeps you cool and dry. 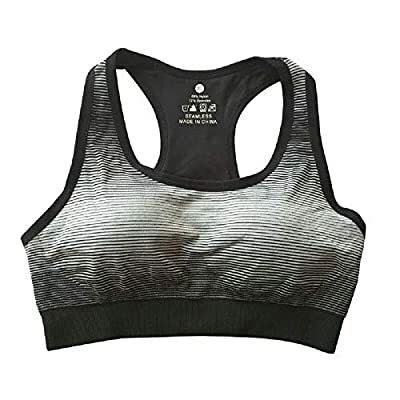 Racerback of the Sports Bra Provide High Support and Anti-Shock; Wide Shoulder Straps of the Sports Bra Feels Ultra Smooth and Medium Push Up Even During High Impact Activity Ideal for everyday active lifestyle like Sports,Gym Exercise & Fitness,Yoga,Walking & Jogging & Running,Cycling,Boxing,Bowling,Tenis,etc.....BEFORE BUYING ALWAYS CHECK THE SELLER NAME IS RITU CREATION FOR ORIGINAL RITU CREATION PRODUCT.